Film Review: "Harry Potter and the Deathly Hallows - Part 2" (2011). 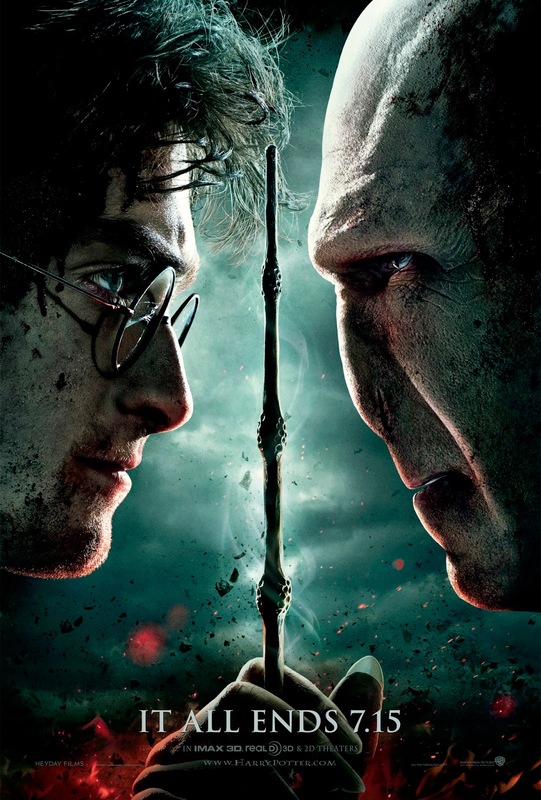 The tagline of the film reads "It All Ends Here", and, sadly, it's really the end for Harry Potter with Harry Potter and the Deathly Hallows - Part 2. This fantasy film directed by David Yates; adapted by Steve Kloves; based on the novel Harry Potter and the Deathly Hallows by J. K. Rowling. It is the second of two cinematic parts, as well as being the eighth and final instalment in the Harry Potter film series. It is the sequel to Harry Potter and the Deathly Hallows - Part 1 (2010). The story continues to follow Harry Potter's quest to find and destroy Lord Voldemort's Horcruxes in order to stop him once and for all. This British-American film series, based on the novels by author J. K. Rowling, is now coming to a bitter-sweet end. Beginning with Harry Potter and the Philosopher's Stone in 2001 and culminating with Deathly Hallows – Part 2 this year. But how this unlikely phenomenon begin? Late in 1997, film producer David Heyman's London offices received a copy of the first book in what would become Rowling's series of seven Harry Potter novels. The book, Harry Potter and the Philosopher's Stone, was relegated to a low-priority bookshelf, where it was discovered by a secretary who read it and gave it to Heyman with a positive review. Consequently, Heyman, who had originally disliked "the rubbish title", read the book himself. Highly impressed by Rowling's work, he began the process that led to one of the most successful cinematic franchises of all time. Heyman's enthusiasm led to Rowling's 1999 sale of the film rights for the first four Harry Potter books to Warner Bros. for a reported £1 million (US$2,000,000). A demand Rowling made was that the principal cast be kept strictly British. Rowling was hesitant to sell the rights because she "didn't want to give them control over the rest of the story" by selling the rights to the characters, which would have enabled Warner Bros. to make non-author-written sequels. Then conversations began with potential directors, including Chris Columbus, Jonathan Demme, Terry Gilliam, Mike Newell, Alan Parker, Wolfgang Petersen, Rob Reiner, Tim Robbins, Brad Silberling, and Peter Weir to helm the first instalment. It was then narrowed down to Columbus, Gilliam, Parker, and Silberling. Rowling's first choice was Terry Gilliam. However, on 28 March 2000 Columbus was appointed as director of the film, with Warner Bros. citing his work on other family films such as Home Alone (1990) and Mrs. Doubtfire (1993) as influences for their decision. Steve Kloves was selected to write the screenplay for the first film. He described adapting the book as "tough" since it did not "lend itself to adaptation as well as the next two books". In 2000, after a seven-month search, lead actor Daniel Radcliffe was discovered by producer David Heyman and writer Steve Kloves seated just behind them in a theatre. Also in 2000, the then unknown British actors Emma Watson and Rupert Grint were selected from thousands of auditioning children to play the roles of Hermione Granger and Ron Weasley, respectively. Their only previous acting experience was in school plays. Grint was eleven years old and Watson ten at the time they were cast. Filming of the series began at Leavesden Studios, Hertfordshire, England, in September 2000 and ended in December 2010, with post-production on the final film lasting until summer 2011. Leavesden Studios was the main base for filming the series. For much of the series, each novel was adapted into a singular film. However, for the seventh and final novel, Warner Bros. decided to split the Deathly Hallows, into two cinematic parts. The two parts were filmed back-to-back from early 2009 to summer 2010, with the completion of reshoots taking place on 21 December 2010; this marked the end of filming Harry Potter. Heyman stated that Deathly Hallows was "shot as one film" but released in two feature-length parts. All the films have been a success financially and critically, making the franchise one of the major Hollywood "tent-poles" akin to James Bond, Star Wars, Indiana Jones and Pirates of the Caribbean. The series is noted by audiences for growing visually darker and more mature as each film was released. The franchise would become the 2nd highest grossing film franchise of all time behind only the Marvel Cinematic Universe films, with the eight films released grossing over $7.7 billion worldwide. Without adjusting for inflation, this is higher than the first 22 James Bond films and the six films in the Star Wars franchise. Chris Columbus's Philosopher's Stone became the highest-grossing Harry Potter film worldwide upon completing its theatrical run in 2002, while Alfonso Cuarón's Prisoner of Azkaban grossed the least. The film stars Daniel Radcliffe, Rupert Grint, Emma Watson as Harry Potter, Ron Weasley and Hermione Granger. As well as Helena Bonham Carter as Bellatrix Lestrange, Robbie Coltrane as Rubeus Hagrid, Warwick Davis as Filius Flitwick, Tom Felton as Draco Malfoy, Ralph Fiennes as Lord Voldemort, Michael Gambon as Albus Dumbledore, John Hurt as Mr Ollivander, Jason Isaacs as Lucius Malfoy, Kelly Macdonald as Helena Ravenclaw, Alan Rickman as Severus Snape, Maggie Smith as Minerva McGonagall, David Thewlis as Remus Lupin and Julie Walters as Molly Weasley. The cast gave the best performances of any instalment and probably the best performances of their careers. Especially to the three leads, they proved to be the right heroes and role models for these times filled with troubled youths. With the unflinchingly grim Deathly Hallows - Part 2, the Harry Potter franchise comes to an exciting, poignant, and overall satisfying conclusion. It's scorchingly tense. The movie is genuinely powerful and this might be the most emotional blockbuster in recent memory, a film that starts out full of magic and goes on that promise, then to deliver a glimmer of hope in the final moments. It’s a bold statement about the unforgiving nature of war and death, unashamedly dreadful conflict between good and evil and the devastatingly human spirit in its emotional effect. 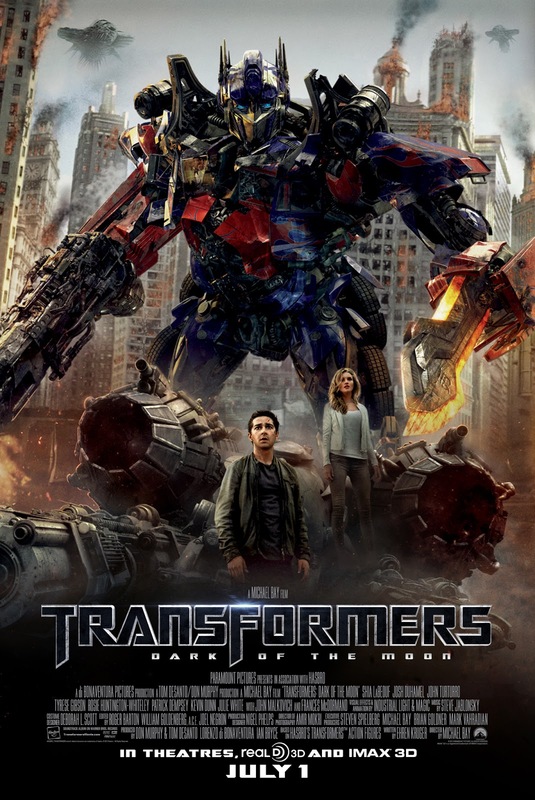 Film Review: "Transformers: Dark of the Moon" (2011). "Years from now they're going to ask us: where were you when they took over the planet? We're gonna say: we stood by and watched." And that is exactly that AGAIN with Transformers: Dark of the Moon. This science fiction action film directed by Michael Bay, based on the Transformers toy line. It is the third installment of the live-action Transformers film series. It is a sequel to 2009's Revenge of the Fallen. This instalment follows the Autobots as they learn of a Cybertronian spacecraft hidden on the moon, and their race against the Decepticons to reach it and to learn its secrets. After the stink-bomb that was known as Revenge of the Fallen, screenwriters Roberto Orci and Alex Kurtzman, who had worked on the two previous Transformers films, declined to return for the third film. So Revenge of the Fallen '​s co-writer Ehren Kruger became the sole screenwriter for Dark of the Moon. Kruger had frequent meetings with Industrial Light & Magic's visual effects producers, who suggested plot points such as the scenes in Chernobyl. In October 2009, Bay revealed that Dark of the Moon had already gone into pre-production, and its planned release was back to its originally intended date of July 1, 2011. Due to the revived interest in 3-D technology brought in by the success of Avatar (2009), talks between Paramount, ILM, and Bay had considered the possibility of the next Transformers film being filmed in 3-D, and testing was performed to bring the technology into Bay's work. Bay originally was not much interested in the format as he felt it did not fit his "aggressive style" of filmmaking, but he was convinced after talks with Avatar director James Cameron, who even offered the technical crew from that film. The film stars Shia LaBeouf, Josh Duhamel, John Turturro, Tyrese Gibson, Rosie Huntington-Whiteley, Patrick Dempsey, Peter Cullen, Leonard Nimoy, Hugo Weaving, Kevin Dunn, Julie White, John Malkovich, Frances McDormand, Alan Tudyk and Ken Jeong. The performances given by the cast are some of the worst performances they have ever given. As well as being some of the most worthless performance given by them. End... of... story. LaBeouf said regarding the last film; "We got lost. We tried to get bigger. It's what happens to sequels. It's like, how do you top the first one? You've got to go bigger... and I think you lost the anchor... You lost a bit of the relationships. Unless you have those relationships, then the movie doesn't matter. Then it's just a bunch of robots fighting each other." Boy that is also the case with Transformers: Dark of the Moon. It's another noisy, underplotted, and overlong special effects extravaganza that lacks a human touch. With the third installment in Michael Bay's blockbuster Transformers franchise, nothing is in disguise: Fans of loud, effects-driven action will find satisfaction, and all others need not apply. The longer this franchise goes on, the less interesting it becomes; it just wears you down. This series was never good, but it was once fun, or at least flashy. Now that its gears have gone rusty, it’s time for an Alien vs. Predator-style rethink.